Toilets almost never leak, right? But when they actually do, you are completely stunned. You don’t know what to do. And it doesn’t end there. What do you do if your toilet is clogged? Most of the time, the first thing that comes to mind won’t work and you’re in for some water damage Chula Vista style. There are a couple of super easy things you can do BEFORE calling in the plumber. You can help prevent large scale water damage if you act quickly and this article will show you how. What’s more, we’ll also share an invaluable insight into getting insurance coverage in case of a toilet overflow. You see water slowly running into the toilet bowl. You might think ‘’that’s not a big deal, at least it’s flowing into the toilet drain’’ – WRONG! Not only are you silently wasting water and your utility bills are getting higher, but you are also risking serious water damage. There is one thing you should do NOW. 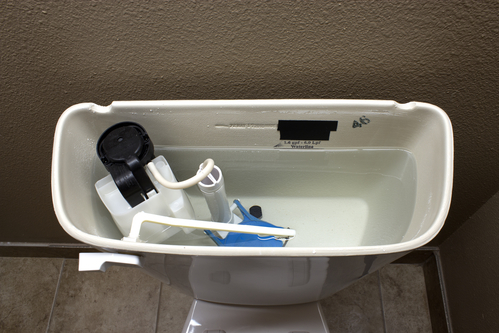 When I say now, I mean this instant – buy a complete toilet overhaul replacement kit. It only costs about $20, and it replaces everything you will otherwise buy separately, from the flapper to the rubber seals. If you decide to buy them separately, you are likely to forget something. Close your toilet’s water supply. It is typically located behind the toilet bowl and beneath the tank. Remove the flapper. You can slide it up and off the overflow tube or unhook its ears from the overflow tube. Install the new flapper. Simply slide it down and over the overflow tube. Flush the water. If it still leaks, something else is causing the leak. Replace the toilet water fill valve (comes with the kit). Align the small plastic water fill tube properly (also comes with the kit). Plunge the toilet. You only need a standard plunger with the rubber flange. Push in and out a couple of times. Push gently at the beginning, and later alternate steady strokes and vigorous pushes. Remember – the water will splash out, so keep a towel or two handy. Pull out the clog with the plumbing snake. For persistent clogs, you need to place the snake’s wire into the drain, hook the clog and pull it out. And don’t forget your gloves. This step is easy, but can get messy. Chemicals of any kind are a huge no-no. Even though most chemicals might do the dirty work for you, they usually take a lot of time. What’s more, in case of an unexpected overflow, the water will be littered with dangerous chemicals sprawling all over your bathroom floor. The mixture of vinegar and baking soda works great with clogs, but rather with clogged shower drains than clogged toilets. Close the toilet’s water supply. Remove the water. Use protective gloves! Disinfect and wash the dampened surfaces. Take out the kit and look into and behind the toilet bowl. Depending on whether there is water leaking into the bowl or there is a clog, proceed with the appropriate steps as explained above. In case of a toilet overflow caused by a localized leak or a clog, the subsequent water damage will be covered by your standard homeowners’ insurance. Moreover, if the overflow was sudden, you are bound to get the coverage. However, if the sewer line was clogged and it caused your toilet to overflow, the homeowners’ insurance won’t cover it. To be able to get coverage for the water damage and the subsequent water damage restoration or mold remediation service, you need to have Sewer Backup Coverage. It is an inexpensive addition to your standard policy that will cost you around $50. Even though our quick fixes will help you prevent large-scale water damage, if there is continuous leakage, or you suspect your drain or sewer line need repair or maintenance, don’t hesitate to contact KIC Restoration for timely and trustworthy water and flood damage restoration, mold remediation and emergency leak detection. KIC Restoration is the #1 expert in water damage in Chula Vista. We are able to dispatch a technician within one hour after you contact us.